Are you looking for ways and intends to make your windows pristine again? Would you like to know how to skip unpleasant tasks like window cleaning without lifting a finger? 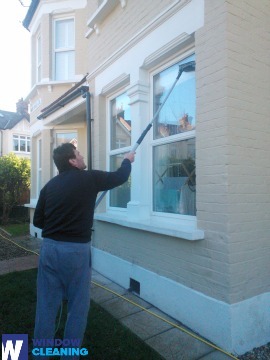 You are in the right place – the specialists of window cleaning in Enfield Chase will manage with this matter in the blink of an eye. Your windows alongside their frames and ledges will look amazing, we promise that! You will no longer need to sacrifice your free time – the results of our work will fully delight you. Our services merge highest quality with reasonable price rates, so don't wait – place an order now to save time, energy and money! We also provide our professional services in nearby areas: Trent Park, Hadley Wood, Oakleigh, Cockfosters, New Barnet. With our know-how and technical expertise, you can count on us for household and business window cleaning. Your home will look pristine after our services, no matter what type of windows you have. We polish and wipe single, double or sash windows, French doors, bay windows and patio doors. Moreover, we clean skylights, garden windows and conservatories. In other words, you can rely on us for flawless cleaning of your windows, including frames and sills. We provide domestic and business window cleaning by using efficient techniques. You can rely on our skills for all types of glass surfaces, roof windows and greenhouses. For windows placed up to the fourth floor, we use water-fed extension poles. This procedure is handy and allows safe cleaning systems – the poles are attached to the water tank in the van. For higher windows, our rope access team will grant you speedy and effective end results. You can gain a lot from these services right now – just call 020 3746 3113 and place an order! The professionals of commercial window cleaning will provide you with first-class service for your work environment. We can go as high as the fourth floor of your office with our water-fed pole system. If you have windows higher than that, we will perform the cleaning with the help of our rope access equipment, designed specifically for difficult to reach glass panes. In other words, you can count on us for efficient window cleaning of all business property kinds - from small shops to the towering office buildings in London. Benefit from our residential window cleaning in Enfield Chase – we provide great services for your home on attractive prices. We use purified water to clean the windows thoroughly. We clean from the ground with water-fed pole method. Talk to us now - dial 020 3746 3113 or just use our booking form. Our staff will help you place an order and answer your questions. You will appreciate the end-results of our domestic services, we guarantee that! The nearest tube station serving EN4 Enfield Chase is Cockfosters.